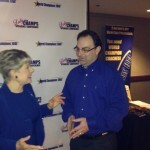 Here are trends in the speaking industry from the “Lady and the Champs Speakers’ Conference. Edt Tate – “Decision makers are becoming gatekeepers. Decision making is moving to higher levels in the company.” Also, he can’t make a living solely as a keynoter any longer. He must have multiple streams of income. Now he does training, consulting and products. Craig Valentine – “Executives realize stories sell… Better selling through story telling. “ You can be in high demand if you can teach story telling. Facts tell. Stories sell. Also, “Sometimes multiple streams of income start with multiple leaks. You have to stick with it.” Their first event had 3 people. They lost money. Now they have 200 people at the conference. Darren LeCroix – “People want video answers.” YouTube is his best marketing tactic. What trends do you see? List them on my blog!